35 ist ein stolzes Alter! RIP, Mercedes! Am 8.5. haben wir wieder den Zoo Kansas City besucht. Nikita ist gross und kraeftig, er hat eine sehr schoene Anlage. Wir haben ihn im Februar gesehen. Er ist den ganzen Tag im Kreis geschwommen. Er hat auch die Spielsachen im Gehege, aber er hat nicht gespielt. Auch gestern ist er auf die gleiche Weise geschwommen. Wir kamen erst um 11, Nukita schwam, dann haben wir uns den ganzen Zoo angesehen. Um 14 Uhr schwam Nikita die gleichen Runden. So kann man sagen, das Gehege allein ist nicht entscheidend. Ein Tier braucht die Anregungen, wie in Wuppertal. Ludmilla, danke für Deinen Bericht aus Kansas City. Wie Recht Du doch hast, wir sagen seit Jahren, dass das Gehege allein nicht ausschlaggebend ist. Es gehört schön mehr zum Wohlgefühl der Tiere in Gefangenschaft. Patricia Roberts hat einen interessanten Bericht aus Aywaille gechickt. Wie alle kleinen Eisbären, ist auch diese süße Maus bezaubernd. Viel Spaß! This last Saturday, I went back to Aywaille. As you will remember from my last story, I got a free ticket and now, I was assured that the little polar bear girl was out in the enclosure. So, my colleague and I left Leuven at around 9.00 a.m. and normally, this trip is taking about one hour by car. But, however this guiding thingie is called (“TomTom” or maybe “Arabelle”), my colleague made it to take the wrong way, so, it took a little longer to arrive there. And therefore, we decided to skip the safari this time and to go straight to Belgium’s pride: Qannik, the little polar bear cub. When I was standing there at that enclosure, I hardly could believe my eyes: it was a Saturday morning, beautiful weather and there was NOBODY!!! Except the two of us. Needless to say, that I was not complaining about that: all space was just there for me. As you will see on the pics, the enclosure as such is not so small, but rather artificial and I hope that one day, Aywaille is having sufficient money to make some “improvements”. But meanwhile, it was obvious that neither Qannik or mother Blanche were having problems with it, because they were playing in and out of the water and each other. It is actually very funny: I have seen so many pics of Knut, Flocke, Patatje, Wilbär when they were all small and also of the new cubs in Germany, but this was actually the very first time in my life that I saw a polar bear cub in real. AH well, what shall I say: this cub (just like all other polar bear cubs that you may have seen) is lovely, cute, breathtaking, charming, goofy, cheeky, lively and beautiful. After a while, we started our first part of walking around in Park Aywaille and exactly like the first time, I realized that the animals do have very huge enclosures and therefore I have tried to give you an idea of that on some of my pics. For some of the enclosures (like for bison, kariboe, emus, kangouroos) the layout might look very basic, but everything needed is present. And furthermore, as I told you before, Aywaille is not comparable to a zoo. During winter time, the parc is closed and all animals have to stay inside. You will remember that I told you that this is actually a family business and therefore does not benefit of any kind of subsidies. When we were there the first time on March 12, most of the animals were not even outside (still too cold for most of them), but now, the entire park was full of life. All of a sudden, my colleague discovered the wolves and then, there was no possibility to stop her: she must visit these beauties. And while we were admiring their grandeur, a “little grandeur” stepped out of the stable and presented his lovely cuteness to us (made a video of it, blurry as can be, but who cares). There were a lot of AAHS and OOHS from our side, but baby was actually not impressed and waggled on his little feet wherever the road may lead him (na ja, not too far away from mammy, of course). Later, when I met the keeper who gave us the free tickets, I asked them when they were born and he told me that it happened the week after our visit. In Aywaille, there are a few ape islands surrounded by moats which get their water from natural sources (in other words, rain). Since it has not been raining in Belgium for the last two weeks, the water level in some of these moats was very low and therefore, some of the apes were not outside. But … we saw the Orang Utan isle (Sumatran kind), and believe me, this island is BIIIIG!!!! For those who have seen the outer enclosure in Zoo Berlin, this one in Aywaille is about three times that size. As I already wrote in my former posting (in The Knuipe, remember at that time there were Server problems so my report is most probably lost somewhere, but for those who do remember), Aywaille is located on the High Moors, and more particularly on top of them. Which results in a beautiful landscape wherever you look. Another advantage was: notwithstanding a burning sun (we had 31°C this Saturday), there was a constant wind, and even not a little one!!!! To attract visitors and to earn money, they have developed certain shows: for example, with parrots, sea lions and birds of prey. Well, we decided to attend the show of the big birds and the first thing we heard while waiting was: Considering the strong winds, there might be a risk that the show will be stopped immediately if ever it appears that the birds may become endangered. And the good thing was: nobody protested against this decision, we just waited. What I also appreciated was the reaction of the audience: we were asked to sit still, not to eat, not to smoke, not to yell and certainly not to try to touch the birds. Well, very briefly, everybody respected these request even if the birds were almost sitting on your lap. And the same goes for the show with the sea lions (oh my, the male was more than impressive!!). In summary, I can say that these shows are rather short (about 25 minutes), but they do not give me a bad feeling in the sense of these animals being circus entertainers. Of course, the stomach was also speaking a language of its own and hey, we are in Belgium and believe me, the restaurant offers very good meals (and for a decent price). So, that need was also easily filled and meanwhile, our feet were having some rest. And of course, thereafter, we made again another big tour, leading us to the big cats. Some of these animals are already old but still look good and healthy and their outer enclosures are cages. But …. these cages are of the same size as the outer enclosures that I saw in Berlin, or are even bigger. For example, the lions: there are three – one male and two females; they have rocks, trees, a meadow and a large part with high grass to hide in. But then of course, it started to itch again and so we went back to Qannik. And again, only every now and then, people stood there but for the rest, we had all space for ourselves. And the, we saw her: drinking a bit, doing an urgent peepee, walking around, teasing mommy, banging on the closed doors (I think this must be a characteristic of the female cubs, but it went on and on: BANG, BANG, BANG). My colleague and I have decided to go back to Aywaille and to buy us an annual ticket. To rephrase her words: “knowing that this is a family business, I felt a bit guilty about the free ticket”. And actually, so did I. So needless to say that wherever we could spend a few euros for support, we did it (in the end, it was comparable to the price of a day ticket). 1. It is definitely worth a visit, especially for kids. 2. Maybe, there are not so many different kind of animals, but they all do have a good place. 3. It is not too expensive and for what you pay, you get the quality and the quantity. 4. With regard to the polar bear enclosure: it is NOT small, but rather artificial with regard to the layout (the keeper told me that years ago, BBC paid for it and at that time, it was – according to the then valid standards – a good enclosure). However, according to me and if money would be available, they can certainly and easily make good improvements. For example, at this moment, there is no shadow space (and unfortunately, it is totally oriented to the south, which means a lot of sun) and even on the available space, they could create a little meadow, or a sand heap or a “mulch” bed. I have also noticed that there are no fixed feeding times, but maybe that is not such a disaster. And also, there are no toys!!! But again, this might be a result of their philosophy or their lack of pecunia! 5. I was wearing the T-shirt that Mervi and Mutti gave us with Easter. And when the keeper saw this T-shirt and told me about the young wolves, he said: you know, they were born during the weekend that Knut died. And we had a German broadcasting team here shortly thereafter who informed us about the death of Knut (I have no clue which TV channel it was). When you arrive in Aywaille, there is a young girl making a pic of you with a parrot on your shoulder (again, a little attempt to make some money, but there is no obligation to buy it), but when we left and – of course – asked for the pic, she immediately recognized me because of the T-Shirt. I did not even have to give my voucher, she went straight to me, or better said, straight to my T-shirt and then looked at me: “this is Knut, isn’t it. I am feeling so sad about him”. Well, I had to swallow a few times before I could say a word and in the car on our way back home, I watched this pic and what did I see: my ugly face, a cute parrot and the T-Shirt “Knut forever in my heart”. Qannik, was für ein eigenartiger und schöner Name. Tolle Fotos von dem kleinen Eisbärchen. Danke, Patricia Roberts für den Bericht aus dem Zoo und die dazugehörenden Fotos, natürlich auch von Qannik. Thank you so much, Patricia, for your wonderful report and the pictures from visiting Aywaille. Oh yes, every people in the whole world knew Knut... also in Aywaille. Bimba, die erst am 04. April aus Pistoia nach Budapest gereist war, ist überraschend am Dienstag, den 03. Mai gestorben. Sie hatte am Abend vorher die ersten Anzeichen einer Erkrankung gezeigt. Da der Zoo Pistoia die Eisbärhaltung aufgab, reiste Bimba am 4. April 2011 nach Budapest in ihre neue Heimat. Bimba wurde am 6. Dezember 1987 in Pistoia geboren und brachte dort 1999 Yoghi und 2006 Blizzard zur Welt. 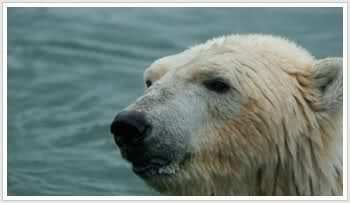 Remember all the wailing and bleeting that followed the recent death in Germany of celebrity polar bear "Knut"? Well, now it's our turn. 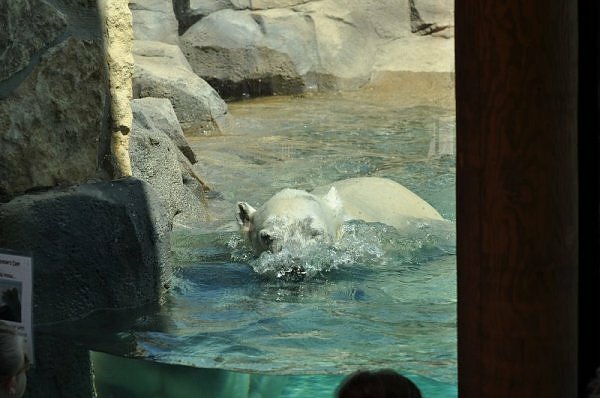 A few days ago a 23-year-old female polar bear named "Bimba" - who arrived at the Budapest Zoo only a month ago - was unexpectedly diagnosed with liver cancer and had to be put to sleep. 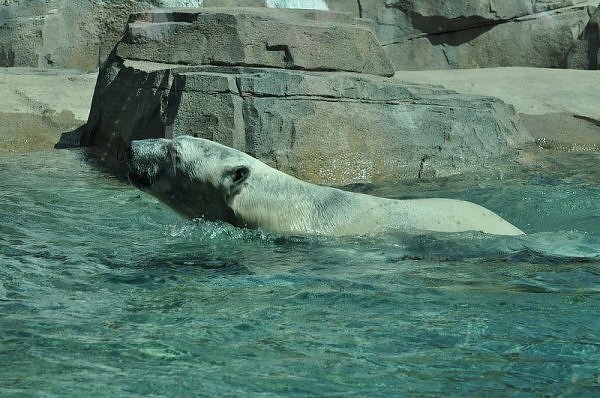 Bimba had been brought to Budapest as part of the polar bear European Endangered Species Programme (EEP) managed by EAZA, the European Association of Zoos and Aquaria. Meanwhile, "Gabi," a 25-year-old brown bear at the Miskolc Zoo, also had to be put to sleep earlier this week due to several chronic diseases. Pretty sad, no? And now just consider that, unlike with Knut, no one seems to give a crap. Dear Ursula, I have read this article also. The author seems to be very angry and lost, but according to me, it is not entirely true that nobody on earth doesn't give a crap about Bimba's and Gaby's death. In other blogs, there were sad comments too. I must confess that I did not know anything about Gaby, but a lot of people (including me) knew who Bimba is/was. It is indeed for this Zoo a tragedy that they have lost her so unexpectedly and also soo fast (only after 4 weeks), but the liver cancer was apparently already in a lethal stadium. I truly hope that this Zoo can soon find another compagnion for their male or that Lady can come back. Freude und Leid liegen oft so dicht beieinander. So auch hier. Freude über die kleine Qannik. und dann leider der Tod von Bimba. Danke Patricia, für die süßen Fotos und den schönen langen Bericht aus Belgien. Das ist sehr traurig mit Bimba. Leider gegen den Leberkrebs ist keine Kraut gewachsen. Yes, I do give a crap!! Es macht mich unendich traurig, dass Bimba so kurz nach dem Verlust ihres Heimatzoos eingeschläfert werden musste. Ihr langjähriger Betreuer in Pistoia wird einmal mehr bittere Tränen vergießen. Gaby kannte ich nicht und wusste nichts von ihr, aber es ist immer traurig, wenn ein Tier euthanisiert werden muss. Gerade erst erschütterte der Tod des vierjährigen Besucherlieblings Knut im Berliner Zoo die vielen Eisbärenfans in Deutschland, da gibt es aus dem Rostocker Zoo positive Nachrichten zu vermelden. Auf der Außenanlage der „Bärenburg“ im Zoo unserer Hansestadt erfolgt derzeit die „Hochzeit“ zwischen den Eisbären Blizzard (4) und Vienna (22). In Zusammenarbeit mit dem Europäischen Erhaltungszuchtprogramm (EEP) wurde im letzten Jahr ein internationaler Tiertausch vorgenommen. Die im Dezember 2002 von Vienna geborene Eisbärin Vilma wurde an den Zoo in Wuppertal abgegeben, wo sie auf ihren Artgenossen Lars traf, dem Vater von Knut. Als Ausgleich kam Mitte Dezember Eisbär Blizzard über das Zuchtprogramm aus Italien in den Zoologischen Garten Rostock. Er wurde 16. Dezember 2006 im Zoo von Pistoia geboren. Mit Blizzard möchte man in der Hansestadt an die langjährigen Zuchterfolge anknüpfen. Die hiesige Eisbärenzucht besitzt eine lange und erfolgreiche Tradition. Über dreißig Eisbären wurden seit 1963 hier geboren und aufgezogen, seit 1980 wird das internationale Eisbärenzuchtbuch in Rostock geführt. Nicht umsonst ist der Eisbär das Wappentier unseres Zoos. Blizzard und Vienna - Eisbären im Zoo Rostock In den vergangenen drei Monaten erfolgte die Eingewöhnung hinter den Kulissen. Seit Januar hatten die beiden Eisbären bereits Gelegenheit, sich am Sichtschieber kennenzulernen. Nun durften sie erstmalig gemeinsam die Außenanlage der „Bärenburg“ erkunden. Obwohl Vienna mit ihren 22 Jahren und sechs aufgezogenen Jungtieren bereits eine erfahrene Dame ist, scheint es zwischen ihr und dem halbstarken Italiener zu funken. Die Chancen stehen gut, dass Vienna den jungen Blizzard als neuen Partner akzeptiert. Somit können der Rostocker Zoo und seine Besucher auf erneuten Eisbärennachwuchs hoffen. Nuenen. 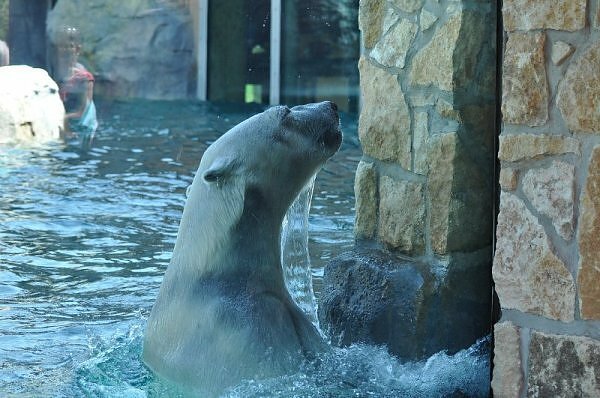 Am Dienstag, 17.05.2011 verreiste der sechsjährige Eisbär Jelle aus dem Dierenrijk Nuenen in sein neues Zuhause, in den Zoo Sauvage de St. Félicien in Kanada, dort wartet die Eisbärin Aisaqvak auf ihn. Jelle ist einer der Drillinge die am 26.11.2005 in Nuenen geboren wurden, Mutter ist Huggies und Vater Victor aus Rostock. Jelle lebt seit 2007 im Tierenreich. Seine Schwester ist Ewa, die mit Wilbär seit Mai 2009 in Orsa beheimatet ist. Sein Bruder Henk bleibt mit seiner neuen Gefährtin Frimas in Nuenen, wo auch die beiden Eisbärinnen Beja und Wash leben. Die Eisbärin Frimas, traf am Donnerstag, dem 19. Mai, in Nuenen ein. Sie und ihre Schwester „Aisaqvak wurden in der Wildnis von Kanada eingefangen, geboren wurden sie vermutlich 2002. Nachdem Aisaqvak im November 2009 die Zwillinge Taiga und Ganuk bekam, lebte Frimas - aus Sicherheitgründen für die Babies - alleine in einem separatem Gehege. Nach erfolgreicher Zucht ist der Eisbär Inukshuk im Juni 2009 wieder zurück in den Zoo von Toronto gebracht worden, er war leihweise in Saint Félicien um sich mit Frimas oder Aisaqvak zu paaren. 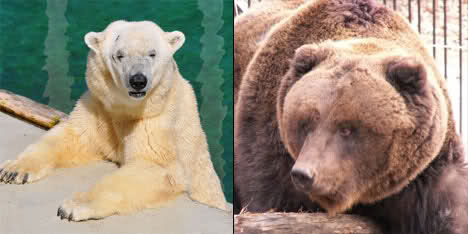 Der "Eisbärentausch" bietet beiden Zoos die Möglichkeit, die Chance auf Nachwuchs zu vergrößern, indem beide Tiergärten ein junges Eisbärenpaar in ihren Tierbestand bekommen. Das ist wirklich einen komplizierten Eisbärentausch. Ich finde schön, dass Frimas nach Europa kommt. Sie ist bestimmt eine schöne Bärin und sie kommt aus der Wildnis, damit ist sie mit keinem Bär aus den Zoos verwandt. da stimmt, frisches Blut ist in Europa dringend notwendig. Die Transportdauer ist natürlich unendlich lang und ich hoffe, dass die beiden Bären den weiten Weg gut verkraften. Was ist schlimmer, 10 Stunden auf dem LKW oder 10 Stunden im Flugzeug?